dane425 has no other items for sale. We purchased this translator to assist us in Argentina. This translator is lightweight so it was easy for us to carry in our back-pack when we were out for the day. If it had been heavier, we would have been inclined to leave it in the hotel room, so the weight and size was perfect. The battery life was long, so that is another great bonus. We didn't replace the battery's at all, in the 2 1/2 weeks that we were in Argentina. The only negative that I have with this translator, which is a big issue, is that it does not have a feature where I could type in my sentence in English and it would translate into Spanish. This translator has many and lots of pre assigned English to Spanish phrases, but I don't want to be taking time to find the right category and menu to scroll down to see if there is an applicable pre-assigned phrase that *might* work. In fact, every time that I need assistance for an English to Spanish phrase, this translator did not have an applicable or appropriate pre-assigned phrase. This point alone, was very frustrating. If you are wanting to learn Spanish in a quiet non human to human setting, then this translator is excellent. If you are expecting this translator to translate your statement or question from English into Spanish, then take a pass on this item. 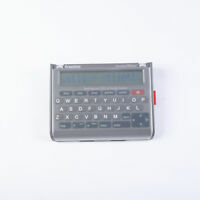 I would recommend this translator because it is lightweight, designed to be user friendly, the key board has a nice feel to it and it does not use up a lot of battery life.